The United States is willing to lift sanctions on North Korea after the country dismantles its nuclear weapons program, the State Department said Tuesday. North Korea has increasingly protested the sanctions, warning that they could return US-North Korea relations to the tense "exchanges of fire" last year and "block the path to denuclearization on the Korean peninsula forever." State Department deputy spokesperson Robert Palladino said "the world remains united" in keeping sanctions on the North until its final and fully verified denuclearization. And as US President Donald Trump has made clear, the spokesman said, "Sanctions relief will follow denuclearization." "The sooner North Korea denuclearizes, the sooner sanctions can be lifted," he said at a regular press briefing. 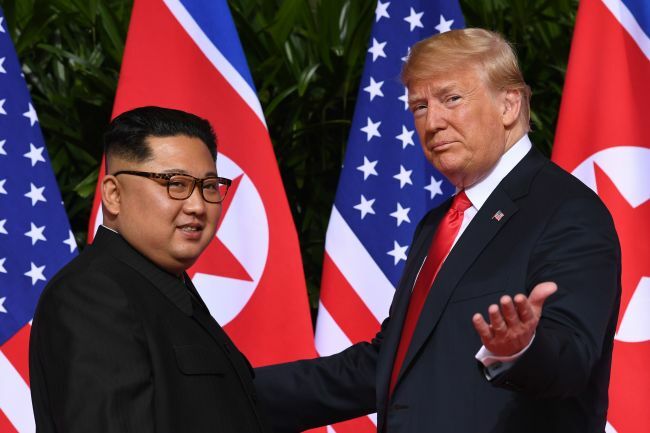 North Korean leader Kim Jong-un committed to "work toward" complete denuclearization of the Korean Peninsula when he met with Trump in Singapore in June. North Korea says it has honored the agreements reached at the summit by demolishing its nuclear testing site and returning the remains of some American soldiers killed in the 1950-53 Korean War. The US, which committed to provide security guarantees to the North, has demanded more denuclearization steps for its promise of major concessions. Communication between the sides is still ongoing, Palladino said, and the US remains "confident" that the summit agreements will be fulfilled. Trump has said he expects to have a second summit with Kim in January or February.